We talked to our veterinarian about the reality of training our cat to walk outside. Here’s what he had to say. In the past few weeks, my cat Foxy has developed an early morning habit of sitting patiently by the front door, waiting for my boyfriend or me to leave for work, so she can explore the hallway of our apartment building. Obviously, since she’s my BFF and I want to take her everywhere, this behavior got me thinking: Should I take my cat on walks? Would she even like walking around outside? And—most importantly—how cool would we look strutting down the street together? I reached out to Dr. David Dilmore, DVM at Banfield Pet Hospital, for his expertise on the subject, and thank Bastet (an Egyptian lioness warrior goddess) I did, because otherwise I probably would’ve rushed the process. Here’s everything I learned about walking your cat. A curious cat doesn’t make your Lewis and Clark: Dr. Dilmore informed me that begging to be let out into the hallway doesn’t necessarily mean Foxy is gunning for a walk in the urban wilderness. Cats that try escaping out the door or lounging by windows may very well be intrigued by the outdoors, but you won’t really know how they’ll fare until you harness train. Harness training 101: First thing to know about harness training: It. Is. A. Process. In part because collars aren’t really an option. “Given cats can be incredibly flexible and agile, a collar may increase the likelihood of an escape,” warns Dr. Dilmore. Collars can also choke cats easily because of their tiny, soft necks. Therefore, you’ve got to make sure your feline is wearing a well-fitting harness (loose enough to fit one finger between the harness and the cat’s neck, but tight enough so you can’t fit two fingers, according to Adventure Cats). 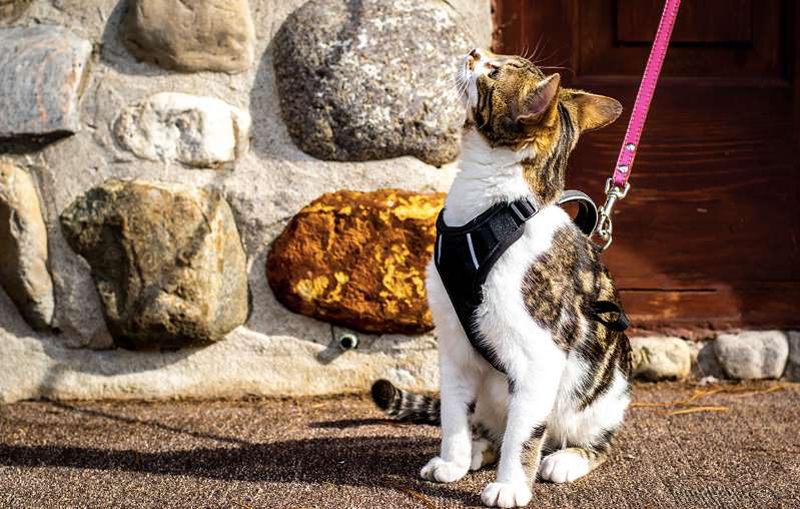 Harnesses with vests are also smart for cats that like to squirm or climb. It’s also easier with younger cats or kittens because that is their peak curiosity and learning time. Also, it takes a while, so the earlier you start, the sooner you’re walking. As Dr. Dilmore advised, you’ve got to introduce them to the harness. If they’re into it, let ’em wear the harness for a bit. Then present them with the leash as though they are royalty. (They are.) Attach the leash to the harness and let them drag it around for a bit. Slowly establish the idea that you’ll be holding onto the leash. Walk them in the house for a while. Going well? Do some short walks in the yard. Give them tons of praise and treats throughout the journey to let them know how great they are doing. All of this can take weeks or even months, depending on your cat’s willingness to participate. Do cat walks mean my cat will do their business outside now? Don’t expect your cat to use walks as a time to go to the bathroom. They will probably still prefer their litter boxes and privacy for this. So, is it really worth all of this work to take my cat outside? For some cats, your love and patience could be highly beneficial to their health and happiness. Indoor and house cats are particularly susceptible to obesity, which Dr. Dilmore notes “can lead to disease of certain vital internal organs like the lungs, heart and liver.” Heavier animals could also experience more complications during surgery or under anesthesia. And, as Dr. Dilmore points out, “One of the most successful approaches to keeping your cat at an ideal weight is exercise and activity.” See: Going on walks. If your adult cat is packing on the pounds, perhaps the excitement of going outside is just the thing to get them into better shape. But remember: If your cat shows any signs of distress, discomfort or a drastic change in behavior, do not force them to harness train. Some cats are made for adventure, while others prefer the controlled environment of their own domestic territory. As always, check with your veterinarian with any other concerns about your cat before venturing outdoors. Pets Magazine: Is walking your cat a good idea or just plain weird?